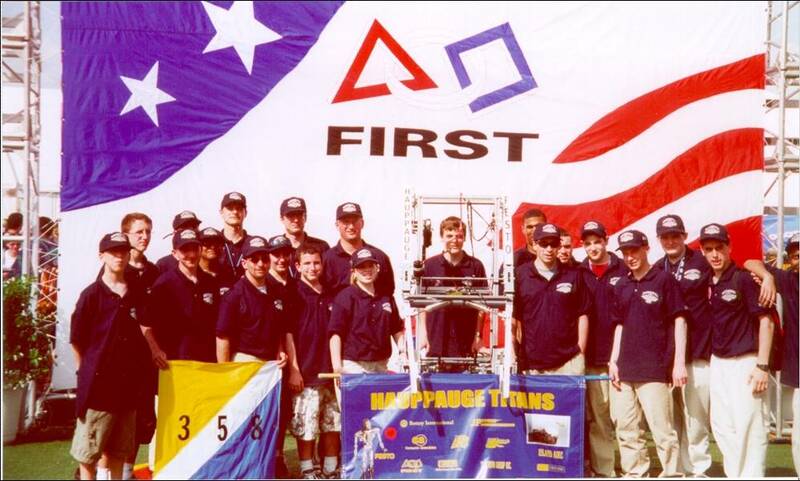 During our second season, in 2001, we continued to build our team still with our first year's core of Festo engineers, but gaining new school advisors and students from outside the Science Research classroom, as well as something else completely new - parent mentors. We were the Titans and our motto was "Another one bites the rust." Our robot was officially named "The Titan," but we all knew it as "The Mantus." This year with a little experience behind us, we also began our outreach efforts to bring FIRST to more schools and students when we and our sponsor Festo presented pneumatics workshops to interested local teams. The concept and operation of pneumatics was pretty foreign to most teams at that time and Festo being a pneumatics company made the workshops a natural fit. 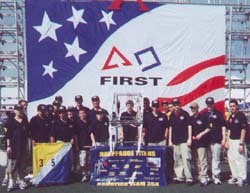 This year's game called for one alliance of four robots on the field at a time and cooperative game play to accomplish several tasks as quickly as possible. 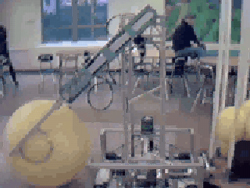 Scores came from getting small balls into movable goals, placing a large score multiplier ball on top of the goals, by having each robot in the End Zone at the end of the match, and by balancing the goals on a teter-totter bridge at the end of the match. Since each robot would share the tasks, with our new robot design we decided to specialize in capping the tall movable goal with a big ball point multiplier. We named our robot �Mantis� for it�s two long fiberglass arms that resembled the arms of a praying mantis. Since it was designed specifically as a big ball handler we capped easily by first latching onto the goal, then simply rotating our arms until the ball was on top. The arms would telescope to reach the top of the tall goal. A lot of effort was expended as we threw our all into the competition, so much so that this year turned into an especially exhausing one for our engineers and teacher advisors. The overload impacted home life and led to some burnout and made us realize that we could easily overdo it and that a proper balance needed to be struck between the build season and other events in our lives. On the positive side are all the benefits of a program such as FIRST of course. We also must mention that this year we had the best shop tool organization we've ever been priviledged to witness before or since. Then that student graduated. We competed on the Curie field (Curie Division Standings (.doc, 183KB) ) at Championships (still being called Nationals) at Epcot in Orlando, FL.